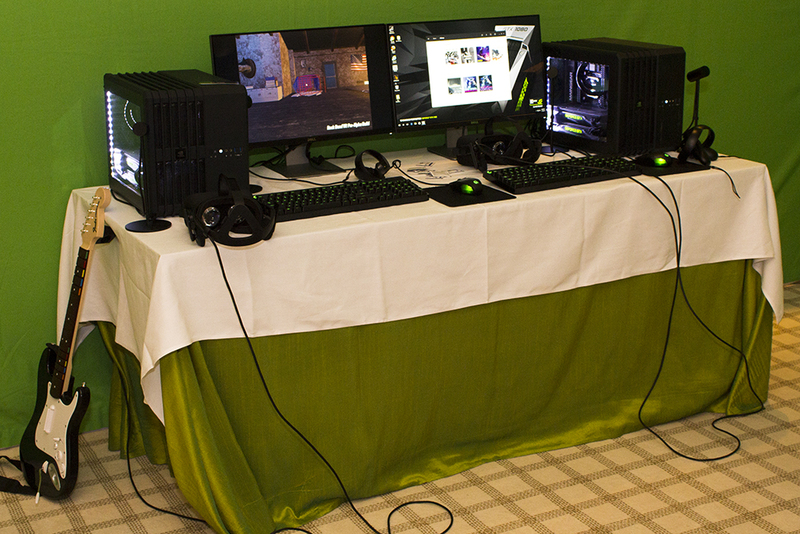 On Sunday we had the pleasure of visiting NVIDIA for multiple product demonstrations. These ranged from living room, to VR headsets, and back to the classic computer desk. Stick with us to see what is new for the green guys! NVIDIA has announced a new iteration of their Shield, the popular TV streaming and gaming device. This redesign comes through due to hardware and software feedback from many sources; consumers, reviewers, and internal. The console itself is 40% smaller than the previous generation and the controller has shrunk as well. They have redesigned the triggers and buttons as well as added a microphone for voice commands through an upcoming Google Assistant update. There is also haptic feedback included in the controller now, to increase gaming immersion, and a 60-hour battery life to make sure you never have issues with Google Assistant hearing you. The remote for the Shield is also included in the package now, instead of being a purchased add-on. Additionally, both the controller and remote have a built-in IR blaster so you can control your TV and sound system with them. Support for 4K UHD movies and games has been added and extends to many apps as well; Netflix, Amazon, and YouTube 360 to name a few. On that note, the new Shield will have YouTube 360 capabilities as well and the demo was quite impressive. The operating system is now based on Android N and seems to be very close to Google’s version, this means quick updates for consumers. As before, there are three ways to game with the Shield. These include GameStream from your PC, GeForce Now cloud games, and native Android games. Taking all of these in to account, the Shield can play almost any game on the market. Ubisoft has signed on to make many of their games compatible natively with the Shield so you do not have to use GameStream for their AAA titles, this even includes multiplayer. Because of the GeForce Now capability, the Shield can produce gaming performance up to 4x the PS4 and Xbox One. GameStream has been completely revamped to alleviate many of the issues it had. Gaming at 4K 60Hz, surround sound, and the Steam app are all fixes that were made. Steam is actually a native integration to the Shield now. Even if your PC only has a lower resolution, or refresh rate, monitor if it is capable of 4K 60Hz gaming performance you can send this through GameStream. With the addition of Google Assistant, NVIDIA found it pertinent to add a Smart Things hub into the new Shield’s capabilities. You can say something like “Ok Google, start my day” to run your morning routine of playing music, turning on lights, and having your coffee brew. There will also be an NVIDIA Spot released later, targeted for a few months, so you can have this capability through multiple rooms of your home. Some other benefits of Google Assistant being added are deep links to apps. You can say multiple things through a series to refine your searches, for example “Ok Google, show me new movies… only drama…” or “Ok Google, play Stranger Things”. Pricing will now be $199 for the 16GB model and $299 for the 500GB Pro model. This pricing is a drop of $50 from the previous generation, definitely a welcome sight. Availability for the 16GB model is 1/16/2017 and for the Pro model it is 1/30/2017. Another update from NVIDIA this year at CES included the updated G-Sync hardware to support 4K HDR. This update involved direct backlighting for supported monitors so a backlight zoning method can be used. Their reasoning here is to highly increase dynamic contrast ratios and to bring better colors to the user. For all G-Sync monitors there is an approval process through NVIDIA to get the hardware certified, this ensures top quality of all monitors with the NVIDIA G-Sync badging to make sure the consumer has the best possible experience. Below are a few comparison pictures of this technology in use. Trust me, pictures cannot do it justice unless you actually have one of these monitors. Coming soon, hopefully in March, is a new gaming service from NVIDIA called GeForce Now. This service allows users to play video games on their system no matter what their hardware specs are. Windows or Mac, integrated or budget, you can play games on any of them. You’re using a system in a datacenter that’s all yours, you get 1TB of install space for user and it will render/stream 1080p 60Hz. The payment model is currently $25 for 20 hours on a GTX 1060 system or 10 hours on a GTX 1080 system, they are not currently considering a pay by month model. The service is scheduled to launch in March with an eight hour free trial for each user. There was a nice demo of the Oculus VR with touch controllers for us to try out at NVIDIA. This demo was run on a system with a single GTX 1080 and the gameplay was absolutely flawless. You’ll see two GPU’s in the picture below, but SLI is not enabled in the demo we were running. Harmonix was also here with NVIDIA to show off the new devlopment on Rock Band VR. That’s all for NVIDIA, folks. Stay tuned for more coverage from our time at CES 2017!